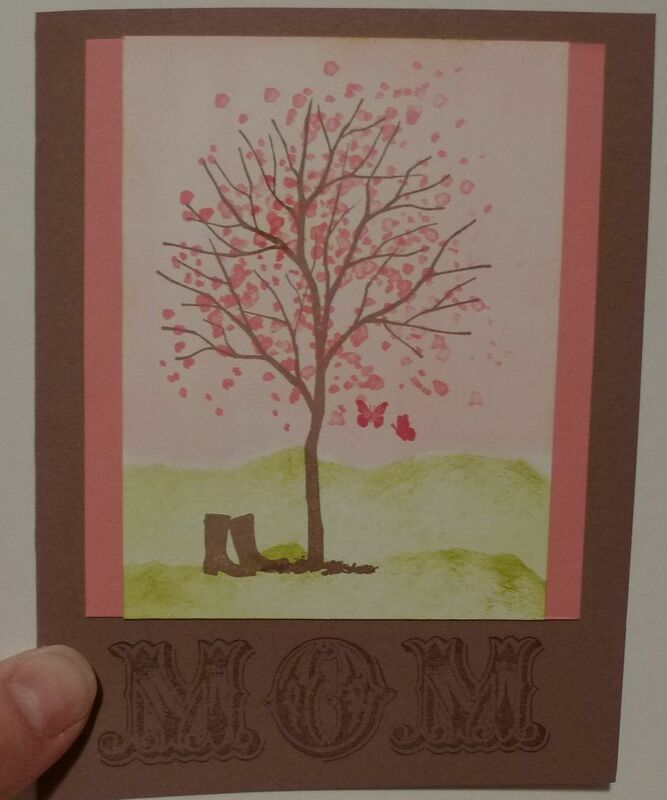 Karina's Kreations: Branch Out Mother's Day Card! Branch Out Mother's Day Card! Branch Out is a retired stamp set but I still love to use it. I thought I would make a quick Mother's Day card using the brayer. I started with a piece of Whisper White card stock and covered the bottom section with a piece of paper. Brayer the top section of the paper with Pretty in Pink Ink. Tear a piece of paper and cover the Pretty in Pink section. Brayer part of the bottom of the card stock with Certainly Celery ink. Move the paper lower and cover the remaining part of the card stock with Certainly Celery ink. Stamp the tree and boots from Branch Out in Close to Cocoa ink. Stamp the leaves in Regal Rose and the butterfly in Rose Red ink. Attach to Regal Rose card stock and then to the card base. Stamp "MOM"from the Messages for Mom stamp set in Close to Cocoa ink on Close to Cocoa card stock.